Premium brand Hudson Baby infant clothes are an attractive and stylish way to dress your precious little one. Made of the highest quality 100% combed cotton these garments are soft to the touch on your baby's skin. This set of coordinating hoodie, pant and bodysuit come in an adorable robot themed design from the Little Robot Collection. Makes a great baby shower gift. 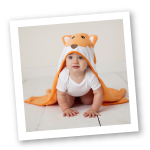 Available in sizes up to 12 months!